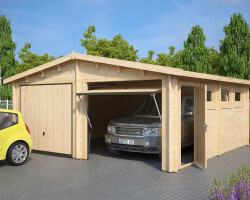 If you are looking for a strong, long-lasting and high quality timber garage or wooden carport, you came to right place. Welcome to our world of quality. 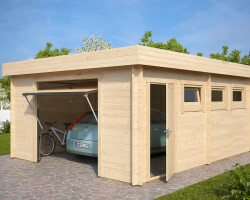 All our garages, double garages and carports are made of the finest Nordic wood. The walls are 40-70 mm thick. A five-year guarantee applies to all of them. Most of them are mostly two or three-day DIY assembly for 2 persons. 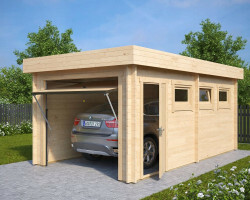 DIY log cabin is the most affordable and fastest way to assemble your own wooden garage. 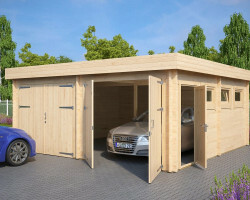 Prices for decent wooden garages start from £3000. This is the minimum to get all necessary details and components delivered. Additionally you need a good and stable base and you may consider a our assembly service depending on your DIY skills and time you have. The cost of a concrete base, including materials and work is around £1500-£2200 and using professionals to get your garage installed will cost approximately £900-£1250. 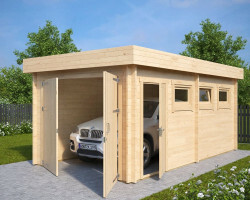 Taking in to consideration all the above costs, meaning that all you do is order your choice of log garage and leave everything else to professionals, you can still have your garage built within a £6000 budget. 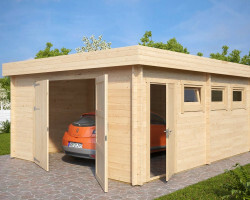 Our „Hansa Line“ timber garages are affordable DIY log cabins with a modern look and superb quality finish. 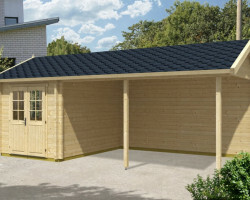 There is no easier way to build your own timber garage or even a wooden double garage other than buying one of our high quality flat pack log cabins. The best foundation for a timber garage is a flat and stable concrete foundation. Concrete foundations are better left to professionals to do. Everything else is achievable for most of us. 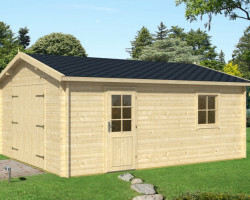 Constructed from sturdy 44mm wall planks, impregnated foundation beams, double glazed windows, metal storm braces, strengthening metal rods in the walls, roof boards, roofing felt, screws, nails, metal fixings and very detailed assembly instructions are all incldued in the standard kit. These wooden structures can easily been assembled within two to four days without hiring professionals. You can choose between double garage doors or „up & over“ type of garage doors. Classic standard double doors are more affordable and easier to install if you choose to go for self assembly, while „up & over“ doors on the other hand are more user friendly and match the modern look. You can add a motor to the doors to make them self opening and closing by using a remote control. All garages have the flexibility to swap the walls and change windows and single door to the opposite wall if that is more convenient for you. These changes can be made during installation without the need to make remarks or changes when ordering. 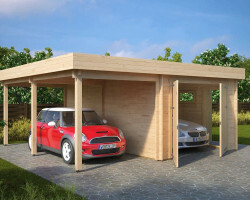 Our smallest garages (type A and C) are 3m wide and 5,5m long. This means that there is enough space even if you are driving an Audi Q7 and still have some space on the sides and rear end for storing your garden tools and other belongings. Type A comes with an apex roof and Type C with our bestselling Hansa flat roof. 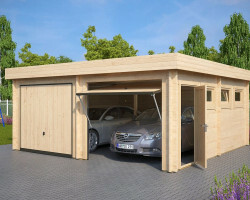 B and D type garages are 4,5m wide, so taking into consideration, that average car is 2m wide, you can get a good idea of how much extra space you will get for storage purposes or having a small DIY workshop in the corner of your garage. 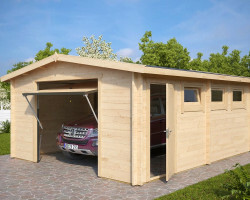 Timber Garage B has a classic apex roof and Garage D comes with a modern looking flat roof. 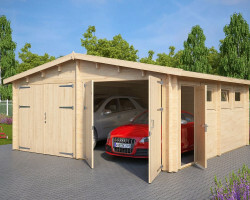 Wooden double garages (type E & F) are mostly used as a safe haven for two cars, but could also make a great combination of a garage and large DIY workshop or even a garage + man cave in one log cabin! The E Type of double garage comes with a classic apex roof and F type with a flat roof. 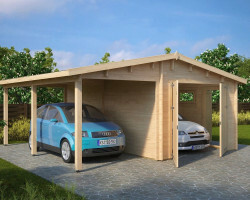 G and H models are a garage and carport combined in one DIY log cabin. 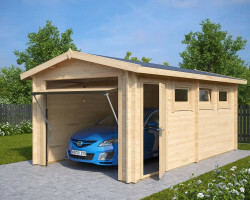 Standard models have the garage on the right hand side and carport on the left, but you can swap locations and install it the other way around if required. 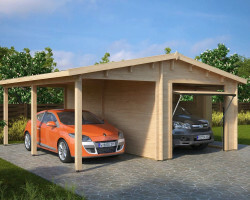 Whether you use the carport area for a car or setting up a cozy outdoor recreational area depends on you. 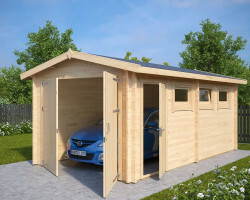 Most of our wooden carports are in combination with a spacious 5-7 m² sheds to take care of your beloved car, and have a place to store your garden equipment or use it as a workshop . 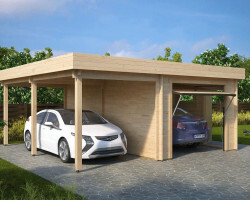 Wooden carports are a smart solution to save your precious space in garden and your money.